Excelocity develops embedded turnkey Voice and Video over Packet (V2oP) solutions for Tier 1 and Tier 2 telecom product vendors. Over the past four years the solutions have included turnkey Voice over Packet (VoP) gateways and VoP terminal products on the clients’ new or existing hardware and Operating System (OS) platforms. Excelocity has developed a unique specific V2oP gateway design and development framework to improve the time to market, reduce costs and improve the built in quality for our customers’ turnkey gateway solutions. This Framework provides various tool kit components for building subsets of or complete VoIP gateways in a fraction of the time normally required for custom solutions. As the framework is independent of the hardware and OS platforms and the specific Digital Signal Processors (DSP), we can mix and match the best in class components in these areas to meet your needs while maintaining a consistent architecture and design. It is very beneficial for vendors that are interested in different product variations that might require different version of components for unique market needs, cost or scalability issues. The Excelocity XL- Gateway Framework©, is unique in that it not only provides an environment for the cost effective integration of the necessary 3rd party and custom software for a gateway product but it also has its own unique value added components. 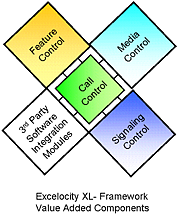 The XL-Gateway Framework has licensable Excelocity software components that provide the Media, Signaling, Call and Feature control functions required for a V2oP gateway. 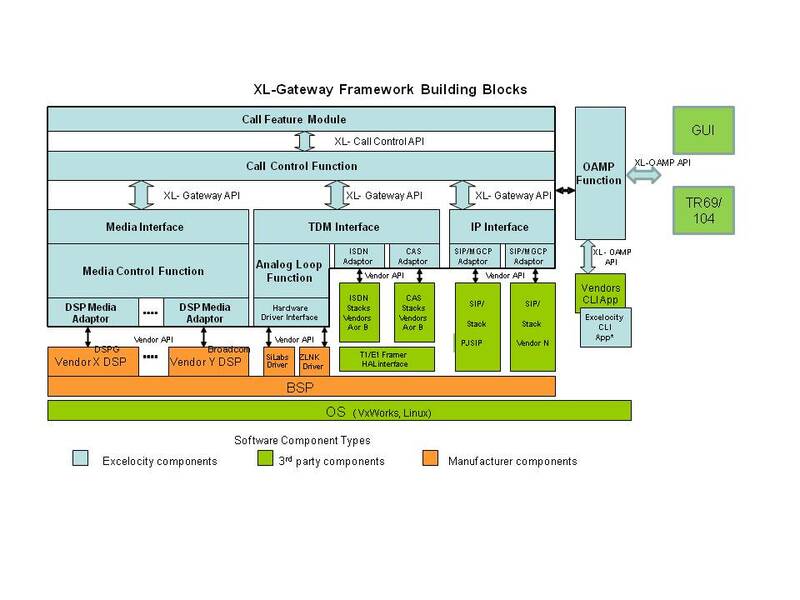 The XL- Gateway Framework is based on a layered architecture with defined APIs between the layers. The core elements are the Call Control Function, Media Control Function and Signaling Functions. As well, there are specific hardware drivers and software adaptor modules to interface with the 3rd party components. These main functional components are themselves stand-alone licensable software components that have a structured architecture and set of APIs. Thus they can be used in a wide variety of design projects where just their functionality is required. One of the major benefits to product companies, that need a gateway but want to focus their effort on features and application, is that the XL-Gateway Framework provides very high level APIs into the Call Control or Feature Control functions. Using these APIs it is much easier to develop value added services, application, and additional features. Your designers do not need to be concerned with managing all the lower level protocol and hardware management interactions as that is done by the solution developed with the Framework. For example, the Call Control APIs can be used to interface to higher level Voice Features and Multi-Media applications, such as those of a PBX, Residential Gateway, or Set-top box. The same framework can be used for building small as well as large footprint gateway products for either Enterprise or Carrier applications. The products can also be either standalone gateways or embedded gateways running on your existing hardware platforms such as routers, switches, etc. An integrated design approach that ensures all the right hardware and software are integrated correctly from the start. 2 to 3 times improvement in the time to market for high quality V2oIP products. Support for real time OSs such as Real-Time Linux and VxWorks. The individual buildings blocks and their APIs can be used independently for designs that may not require the full set of the Framework capabilities. Due to the separation from the physical levels, the same gateway functions can be ported, reused or developed for multiple products on different hardware and OS platforms. Various vendors’ DSPs can easily be integrated into the solution, because we use generic software and hardware adaptation layer modules. Excelocity is developing a library of these for specific vendors’ products. Using a mix of custom code and licensed framework components speeds up the development process. Download our XL-Gateway Framework brochure for additional details and information about the tool kit.